Alfie Gill was born with cerebral palsy, dystonia, epilepsy, a curvature of the spine as well as being quadriplegic. His loving parents Anthony and Jane wanted the very best for him. 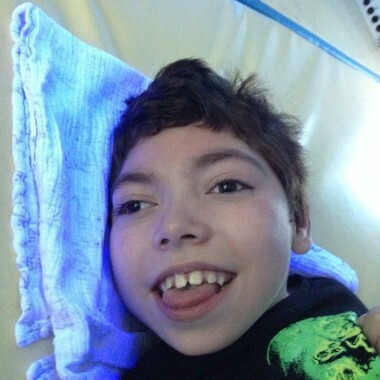 They wanted him to achieve his full potential and with the help of Alfie’s case manager they set about putting the best package of care around him to support and encourage him. Alfie was treated on the NHS and still receives some NHS treatment. His parents however were happy to try private health care to see if it could help Alfie further, and help him it did! “The treatment provided by PSP has made such a great difference to Alfie’s life. We knew straight away that this was the best thing for him.” said Alfie’s mum Jane. Alfie has been working with PSP for over two years now and the improvement in his heath is clear to see. Alfie was prone to chest infections which would often lead to hospital stays. These have become much less as a result of the chest physiotherapy he receives. Alfie’s parents are now able to deliver this physiotherapy thanks to the training they received from PSP. Fewer hospital visits is great news for Alfie and for the rest of the family including his older brother and younger sister. Alfie continues to receive ongoing neurological assessments and neurological and respiratory physiotherapy from PSP. The basis for these treatment sessions have been to maintain and improve joint alignment and muscle length, increase engagement within play and sensory activities and reduce respiratory infections. Alongside physiotherapy, Alfie has also been provided with a DMO lycra suit to be worn on a daily basis.